The Faiez Serraj-aligned Libyan Army official spokesperson Mohamed Gnunu at yesterday’s press conference in Tripoli (Photo: PC/GNA). The Faiez Serraj Presidency Council and Government of National Accord-aligned Libyan Army and its allied forces taking part in Operation Volcano of Rage (anger/fury) ‘‘have made great progress in all axes, and the enemy has suffered heavy losses in mechanisms and materiel, while the Hafter militias fled from more than one location from the blows of our brave heroes’’, claimed Libyan Army official spokesperson Colonel Mohamed Gnunu. Speaking during a press briefing held on Saturday at the Media Centre of the Prime Minister’s Office in Tripoli, he said that the Serraj-aligned forces took control in the Western military area of al-Aziziya, including the Fourth Brigade Barracks and ‘‘arrested a number of militants’’ while ‘‘the rest fled’’ towards Swani and Qaser Ben Ghashir. Gnunu said that the Serraj-aligned Air Force carried out 21 combat sorties on Friday and Saturday, targeting enemy supply lines, military positions such as camp Aburshada, camp Sahban and the Wattya Airbase ‘‘from which the coupists take-off to target civilians’’. He said that the Serraj-aligned Libyan Army forces in the Western Military Region had seized infiltrators south of Gharian with materiel and supplies trying to deliver them to the pursued coupists in the vicinity of Tripoli. These were ‘‘arrested’’ and ‘‘the noose was further tightened on the accomplices of Haftar’’, he added. Gnunu said that ‘‘after the losses suffered by the coupist militias on the ground, the coupsist Air Force intervened to rescue them. But their Air Force targeted residential neighbourhoods and civil and educational institutions in a new breach of all international conventions for the protection of civilians, to add a new chapter to his (Hafter) past crimes’’. He added that the Air Force of the ‘‘coupist Haftar, renewed its attempts to target Mitiqa airport, seeking to strike a prison containing hundreds of detainees in connection with terrorism-related cases arrested in Sirte during the Bunyan Marsous Operation’’. “On our part’’, Gnunu continued, ‘‘and as a commitment to our duty to protect Libyans, your Libyan Army has continued today to contribute to the evacuation of families stuck in some areas of engagement after the indiscriminate shelling by heavy weaponry by the coupists of their homes and the threat of their lives, especially in the axis of Ain Zara, where’’, Gnunu said ‘‘our heroes today wrote an epic, immortalized by history’’. Gnunu also added that ‘‘affirming our commitment to international covenants and in implementation of the instructions of the leaders of the operation, the Libyan Red Crescent teams were allowed to inspect those arrested on the battlefield who were implicated in the failed coup attempt. Gnunu concluded by saying that the Serraj-aligned Libyan Army ‘‘did not start this war, but it is the one who will determine the time and place of its end’’. Meanwhile, the Tripoli Protection Force (TPF), a coalition of the main Tripoli-based and Serraj-aligned militias said yesterday that it was awaiting orders to switch from a defensive fighting mode to an offensive mode. 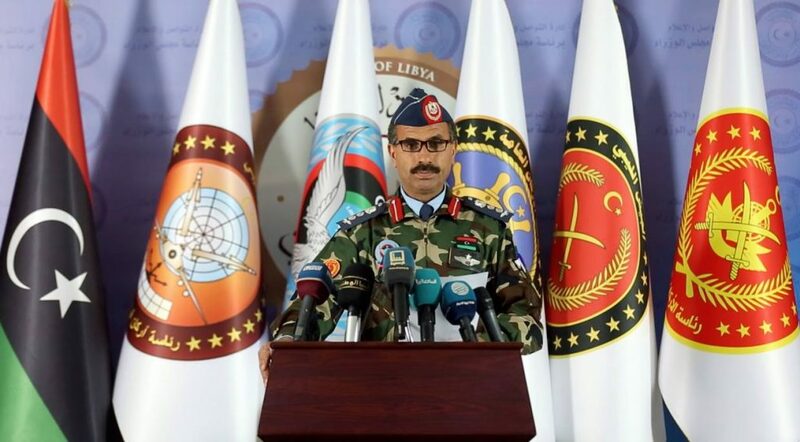 On the other hand, the official spokesperson for the Khalifa Hafter-led Libyan National Army (LNA) and their aligned forces, Ahmed Mesmari, claimed yesterday that the LNA Air Force had conducted ‘‘eight sorties, targeting enemy positions’’. These were ‘‘Targeting the main militia operations room at al-Saadawi camp, al-Rahba camp where militiaman Al-Bugra is based, a gathering of mechanized vehicles in Kremia, the Presidential Guard headquarters but (that) the bombs did not explode, three gatherings near the 60 House, a gathering near Swani, a target at the Kasarat (Quarry) and hitting the Bunyan Marsous operations room east of Ghoat Al-Ruman checkpoint”. The LNA War Information Division, for its part, claimed that while their forces were taking care to avoid hitting civilian locations, it accused the Serraj-aligned Air Force, taking off from Misrata, of hitting civilian sites. It also claimed to have ‘‘killed dozens of terrorists’’ and ‘‘their mechanisms, weapons and equipment confiscated’’. It said that it will not reveal ‘‘the location of the operation until all operations are completed in order to preserve our soldiers, conduct battles and confirm the surprise element on the enemy’’.